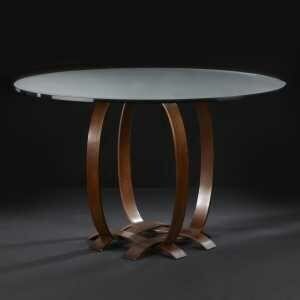 Bring a unique design element into your dining room with this walnut finished dining table. The bowed leg design flows into the wood woven footing at the base of the table. With the glass table top, the clean-up process has never been easier. The Ribbon 48" Dining Table by C.S. Wo & Sons at C. S. Wo & Sons Hawaii in the Hawaii, Honolulu, Oahu, Hawaiian Islands, Waikiki, Diamond Head, East Honolulu area. Product availability may vary. Contact us for the most current availability on this product. Browse other items in the Ribbon collection from C. S. Wo & Sons Hawaii in the Hawaii, Honolulu, Oahu, Hawaiian Islands, Waikiki, Diamond Head, East Honolulu area.